KRATER COMEDY CLUB: Until Sept 9, 7pm/8pm/10.30pm, £5-£36.50 Komedia, 44-47 Gardner Street, Brighton 0845 293 8480. CYCLE RIDE: Meet 10am by the Sundial in the Forum outside TK Maxx, Horsham, RH12 1NU. 2½ hour ride with information about the poet Shelley’s early experiences in Horsham and how it influenced his life and work. Easy on and off-road ride. Info: Ian Ford 07764 146338. LEWES RIVERSIDE CLUB: A Passion For Piers by Jackie Marsh Hobbs, 2pm St Thomas’s Church Hall, Cliffe, Lewes. Spirit Ball: Dance the night away. Licenced bar, 7.30pm-11pm, £12 per ticket. Barnham Community Hall, Yapton and Barnham SNU Spiritualist Pioneer Centre. WALK: Meet 11am, Barns Green village car park (enter over yellow hatched lines outside the Village Hall) RH13 0PT. Two-mile HDC Health walk, mostly flat, mainly on firm ground. Well behaved dogs welcome. 1 hour. Chatter Cheema 07720 714306. CORINNE BAILEY RAE: £30-£45, 7pm De la Warr Pavilion, Bexhill (01424) 229111. Pluss support, Andreya Triana. GIGNITE: Phrase Mob, Red Mosquito, The Big Sky, The Shelley Arms, Broadbridge Heath, 8pm. The Boomers: Railway Inn, Billingshurst, 9pm. THE STORY OF GUITAR HEROES: £22-£24, 7.30pm The Royal Hippodrome, Eastbourne (01323) 802020. Live concert style ‘rockumentry’. SARAH MILLICAN: £29, 8pm Assembly Hall, Stoke Abbott Road, Worthing 01903 206206. Control Enthusiast show. CATS PROTECTION: Horsham and District branch. Fundraiser at North Heath Hall, St Marks Lane, 11am-1pm. On sale will be home-made cakes, Cats Protection branded gifts and goodies, books, jewellery, DVDs and CDs, plus a tombola stall. Refreshments will be available, admission is free but donations (including cat food and litter) are warmly received. More info: www.cats.org.uk/horsham. LINDFIELD HORTICULTURAL SOCIETY: 2pm, King Edward Hall, Lindfield. Autumn Show of flowers, produce and more. Teas, coffee and refreshments. All welcome £1. Follow LHS on Facebook and Twitter. MID SUSSEX RAMBLERS: Warninglid Fields and Footpaths, 4.5 miles with Elizabeth B 07989 217818. Meet in Warninglid Lane near the Half Moon Pub, 10am. RUDGWICK Autumn Show: 2.30pm-4.30pm, Rudgwick Village Hall, RH12 3JJ. Horticultural and home fare exhibition and competition, open to all. Refreshments, raffle, cake and garden equipment stalls. RUSTINGTON RESIDENTS ASSOCIATION: Open meeting, 2pm, Rustington Methodist Church Hall. Musical Quiz in teams of four with prizes for the winning team. Open to all. Entrance members £2, non-Members £2.50, children £1. Tea, coffee, squash and biscuits included. WALK: Meet 2pm, Kithurst Hill car park (off the Amberley to Storrington road, B2139) at the top of the lane. 4½ mile HDC walk, some hills, includes a long gentle incline. into the heart of the South Downs with magnificent views towards Arundel. Dogs welcome. 1¾ hours. Mick Denness 01903 745971. LUNCHTIME CONCERT: Free with retiring collection, 1pm St Leonard’s Church, Seaford. Ana Luisa Monterio and Helena Bivar, piano duet. 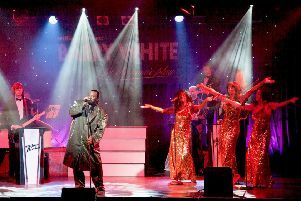 MUSICAL SHOWTIME: £6, 7pm Community Hall, Meridian Centre, Peacehaven (01273) 512771. Tony Stace playing many musical styles. ALTER EGO: The Red Lyon, Slinfold, 8.30pm. BIG FISH LITTLE FISH FAMILY RAVE: Saturday, September 8, 2pm, The Hawth, Crawley, 01293 553636. DIONNE WARWICK: £50-£70, 7pm De la Warr Pavilion, Bexhill (01424) 229111. Don’t Make Me Over Tour. GENO WASHINGTON and THE YO-YO’s: The REC Rooms, Horsham, 8pm. HORSHAM ROCKS PRESENTS: AKA Carole, The Carfax Bandstand, Horsham, 2pm-4pm. LAZY SUSAN DJ NIGHT: £4, members free, 8pm Lewes Con Club, 139 High Street, Lewes 01273 473076. LEWES SATURDAY FOLK CLUB: £12, 8pm Elephant and Castle, Lewes. Kevin Burke, Irish fiddle. MANBITESDOG: The Malt Shovel, Horsham, 8.30pm. PURPLE ZEPPELIN: £17-£18, 7.30pm Chequer Mead, East Grinstead (01342) 302000. The Ultimate Rock Tribute Show. THE GATHERING FOR GARY MOORE: £20, 7pm Latest MusicBar, 14-17 Manchester Street, Brighton (01273) 687171. All star Gary More tribute. DEREK ACHORA: £20, 7.30pm Devonshire Park Theatre, Eastbourne (01323) 412000. Love, Life, Laughter Tour. PAW PATROL LIVE! : From £16.75, 10am/1.30pm/4.30pm and Sept 9, Brighton Centre 0844 8471515. X Marks The Spot musical adventure. APPLE PRESSING DAY: Linklater Pavilion, Railway Land, Lewes 11am-4pm. Free entry, 5p/litre of juice. Bring your apples for pressing. BEACHY HEAD RAMBLERS: The World of Winnie The Pooh, 12.5 miles with Sue D 07803 086840. Meet at Kings Standing car park, Ashdown Forest, 10am. MID SUSSEX RAMBLERS: Clayton Windmills, 5.5 miles with Alison G 01273 833794. Meet at Jack and Jill Windmills car park, 10.30am. WALK: Every Sunday and Wednesday. Meet 2.30pm, Museum in the Causeway, Horsham. Two miles Guided Heritage Walk around Horsham to learn more about its history. Supported by The Horsham Society. 90 minutes. More information: Jill 07780 701184. WALKING TREASURE HUNT: A hunt around Lewes with maps, clues an instructions provided. Meet at the car park at the bottom of Cliffe High street, 10.30am. Adults £5, under 14s free. Contact aps30@aol.com for tickets. LUCY Q JONES: I Will Cut You. £12, 7.30pm Komedia, 44-47 Gardner Street, Brighton 0845 293 8480. SARAH MILLICAN: £31.50, 8pm White Rock Theatre, Hastings (01424) 462288. Control Enthusiast show. LEN PHILLIPS BIG BAND: £18-£20, 3pm Devonshire Park Theatre, Eastbourne (01323) 412000. PASSENGER: £26, 7.30pm Brighton Dome (01273) 709709. With special guest Lucy Rose. BARBARA NICE: ‘Raffle’. £12-£14, 8pm Komedia, 44-47 Gardner Street, Brighton 0845 293 8480. HILARITY FOR CHARITY: £16, 8pm Komedia, 44-47 Gardner Street, Brighton 0845 293 8480. In aid of Chestnut Tree House Children’s Hospice. LEWES HISTORY GROUP: Inside Lewes Heritage Buildings. Town Clocks, The Turkish Baths and Gundrada Chapel by John Downie, Judy Mackerras and Marcus Taylor, 7pm for 7.30pm King’s Church building, Brooks Road, Lewes. OPEN EVENING: Lewes Badminton Club open evening at Lewes Leisure Centre, 8pm Suitable for intermediate or experienced players. SUSSEX FAMILY HISTORY GROUP: Meeting at 7.30pm in Bridge Cottage, High Street, Uckfield. Subject and speaker TBA. THE ARTS SOCIETY STEYNING: Next meeting September 10. Chloe Sayer gives an illustrated talk on Frida Khalo and Diego Rivera: The Golden Age of Mexican Painting. Chloe Sayer is an author and curator, specialising in the art and culture of Latin America. She has made ethnographic collections for the British Museum and is a Research Associate with the Department for World Culture at the Royal Ontario Museum. In 2016 the Mexican Government awarded Chloe the Ohtli medal to thank her for her commitment to Mexican Culture. She has lectured in the UK, Canada, Ireland, Mexico, Australia and New Zealand. Chloe has also assisted on TV documentaries for BBC and Channel 4 as well as publishing books, travel guides and articles for magazines and newspapers. Coffee served from 10am. Talk 10.30am-12pm at The Steyning Centre, Fletchers Croft, Church Street, Steyning. HORSHAM FILM SOCIETY: The Best of World Cinema. Monday, September 10, The Capitol, Horsham, 8pm. Film: The Square (Sweden, 2017, 144 mins, Cert 16). A darkly satirical film about the contemporary art world that veers between comedy and thriller with moments of pure surrealism. Directed by Ruben Östlund and starring Claes Bang, Elisabeth Moss and Dominic West. Winner of the Palme d’Or, Cannes 2017. Guest membership available (tickets £5 on the door). Visit horshamfilmsociety.wix.com/horshamfilmsociety. DYLAN LEBLANC: £14, 7.30pm Latest MusicBar, 14-17 Manchester Street, Brighton (01273) 687171. THE KOOKS: £25, 7pm De la Warr Pavilion, Bexhill (01424) 229111. Pus special guests. MID SUSSEX RAMBLERS: WACT 2018 Poddle Revisited, 12 miles with Ray 01403 783797. Meet at Walberton Village Hall, 10am. TALK: Conflicting Views: Pacifist Artists by Dr Gill Clarke, 2.30pm The Keep, Falmer. £5. FASTLOVE: £26.50, 7.30pm The Hawth Theatre, Crawley (01293) 553636. A tribute to George Michael. THE HABIT OF ART: £15-£37, 7.45pm until Sept 15 (Wed/Sat mat 2.30pm) Theatre Royal, Brighton 0844 871 7650. THE LEAGUE OF GENTLEMEN: From £39.05, 7.30pm and Sept 12, Brighton Centre 0844 8471515. Brand new live show The League of Gentlemen Live Again! JAMALI MADDIX: Vape Lord. 7.30pm/9pm Komedia, 44-47 Gardner Street, Brighton 0845 293 8480. THE NOISE NEXT DOOR: £9-£11, 8pm Komedia, 44-47 Gardner Street, Brighton 0845 293 8480. Comedy Lock-in. BEACHY HEAD RAMBLERS: Ditchling Beacon and Wolstonbury Hill, 10 miles with Mike W 07718 141615. Meet at National Trust car park, Ditchling Beacon, 10am. CYCLE RIDE: Meet 10am outside Broadbridge Heath Leisure Centre, Wickhurst Lane, Horsham, RH12 3YS, for guided, easy starter-level off-road HDC ride on the Downs Link for adults only. Council bikes may be available. Three hours. Further info: Ian Ford 07764 146338. HORSHAM DISTRICT ARCHAEOLOGY TALK: 7.30pm. The Construction of a Neolithic world on Orkney by Jane Russell. Covering the development of the various Chambered tombs, domestic settlements and the ceremonial heartland of Orkney, also including the excavation at the Ness of Brodgar At the Brighton Road Baptist Church, Horsham. SHINE ON THEATRE GROUP: Dance classes on Wednesday and drama classes on Thursday. Shine On Theatre Group welcomes children aged 4-16 years. Classes are at the Scout Headquarters Brown Twins Road (off Trinity Road), Hurstpierpoint. They will be run by professional actors, directors and choreographers. For more information contact Michael Burnie on 07880724870. SUSSEX FAMILY HISTORY GROUP: Women at War by Heather Sheeley, 7.30pm Ventnor Hall, Blatchington Road, Hove. THE ART SOCIETY: The Art Society Uckfield, Lewes and Newick lecture The Vienna Secession. How the Modern Art movement, led by Gustav Klimt, shook of the shackles of the old traditions. Uckfield Civic Centre, 2.30pm. Non members welcome £7. THE ARTS SOCIETY HORSHAM: Lecture at the Capitol Theatre, Horsham. Qing Dynasty: A Journey through the Imperial Wardrobe. David Rosier. Coffee is available from 9.45am. The lecture will start at 10.45am. Non-members are welcome for a fee of £5 payable on entry. U3A OPEN DAY: University of the Third Age, programmes for the coming season, Lewes Town Hall, Corn Exchange, 10am-noon. WALK: Meet 10am in the car park at the Village Hall in Wisborough Green (RH14 0DU). Seven mile HDC walk with numerous stiles, through woods and farmland and alongside the River Arun/Canal. 2¾ hours. No dogs please. Mike 07855 502023. CARMEN: £33.50-£35.50, 7.30pm The Hawth Theatre, Crawley (01293) 553636. The Russian State Opera. THE MERRY WIVES OF WINDSOR: £13-£14.50, 7pm Chequer Mead, East Grinstead (01342) 302000. Royal Shakespeare Company. BIG BAD ANDY: £6.50, 8pm Komedia, 44-47 Gardner Street, Brighton 0845 293 8480. Peep Show Quiz. CHRISTOPHER BLISS: £5-£8, 8pm Komedia, 44-47 Gardner Street, Brighton 0845 293 8480. Christopher Bliss’ Literary Salon. HAYWARDS HEATH CERAMICS GROUP: Monthly meeting, talk on ‘The Development of the Drinking Glass’ by Jane Gardiner. Jane is Senior Tutor of 17th and 18th Century Decorative Arts at Sotheby’s Institute. She has lectured in the USA and in France. Lecture in the Studio, Clair Hall at 10.35am. Doors open 9.45am with coffee served until 10.20am. Non-members are very welcome by prior arrangement with the ,membership secretary (01444 483372 or 414477), entrance £8. Info: hhcg.org.uk. NATIONAL TRUST: The North Sussex Centre of The National Trust will be having a talk on Thursday, September 13. ‘Gardening between Empires’ at The Wesley Hall, London Road, Horsham, 2.30pm. Info: 01403 730162. POLEGATE RAMBLERS: Somewhere Over The Rainbow, Where Skies Are Blue, 5 miles with Roger L 723268. Or, A Ton of Churches, 10.5 miles with John and Theresa 726685. Meet at Wannock Road Recreation Ground, 9.30am. PRESENTATION: Friends of Lewes talk, Saving Fitzroy House by Eleanor Austin, 7.45pm Trinity Church, Southover. £3, members free. MID SUSSEX ASSOCIATION NATIONAL TRUST: 2.30pm, Clair Hall, Haywards Heath, RH16 3DN, Talk: Sir Winston Churchill of Chartwell by Heather Woodward. CLARE BOWEN: £24.50-£31.50, 7.30pm Brighton Dome (01273) 709709. Plus support. OPEN MIC NIGHT: The Frog and Nightgown, Horsham, 8pm. HELLO AGAIN: £25-£27, 7.30pm White Rock Theatre, Hastings (01424) 462288. The Story of Neil Diamond. HORRIBLE HISTORIES: September 13-16. Horrible Histories’ Awful Egyptians and Terrible Tudors head to Horsham’s Capitol. Tickets £15. Call 01403 750220. INTARSI: £14.50-£16.50, 8pm Pavilion Theatre, Marine Parade, Worthing 01903 206206. Physical theatre from Barcelona. Duke Of York’s (0871 902 5728): American Animals (15) Fri 3.30, 8.30; Sat 3.00, 8.30; Sun 2.45, 7.45; Mon 3.30, 8.30; Tue 8.30; Wed 3.30, 8.30; Thu 8.45; Silver Screen: Tue 3.30; Thu 12.00, 3.00; HOH Subtitled: Thu 6.00. Cold War (15) Fri 1.00, 6.15; Sat 12.30, 6.15; Sun 5.30; Mon 1.00, 6.15; Tue 6.15; Wed 6.15; Big Scream: Wed 12.45. Kids’ Club: The Giant Pear (U) Sat 10.30. Toddler Time: Sarah And Duck: Umbrella And Friends (U) Mon 11.30. Vintage Sundays: The Incredibles (U) Sun 12.00. Discover Tuesdays: The Rider (15) Tue 1.00. Orion (01444 243300): Royal Shakespeare Company: The Merry Wives Of Windsor (PG) Wed 7.00. BlacKkKlansman (15) 8.00. Christopher Robin (PG) Sat & Sun 2.15; Fri, Mon, Tue & Thu 5.30; Wed 4.15. Ant-Man And The Wasp (12A) 5.00. Mamma Mia! Here We Go Again (PG) Sat & Sun 7.00; Fri, Mon, Tue & Thu 7.40. Hotel Transylvania 3: A Monster Vacation (U) Sat & Sun 1.30. Incredibles 2 (PG) Sat & Sun 4.00. New Park (01243 786650): Christopher Robin (PG) Fri * Tue 1.15; Sat 5.30; Sun 3.15; Mon 8.45; Wed 2.30; Thu 6.15. The Seagull (12A) Fri 3.45, 6.15; Sat 12.15, 8.00; Sun 12.45, 5.45; Mon 1.15, 6.15; Tue 3.45, 8.45; Wed 12.15, 5.00; Thu 4.00, 8.45. Sicilian Ghost Story (15) Fri 8.30; Mon 3.30; Tue 6.00. Le Corsaire (Scala ‘18) (PG) Sat 2.30. The Apparition (15) Sun 8.00; Thu 1.00. Arts Centre (01483 278000): Lady Bird (15) Fri 8.00. Casablanca (1942) (U) Wed 8.00. Brief Encounter (1945) (PG) Thu 8.00. Curzon (01323 731441): The Escape (15) 2.10 (not Sat & Sun); 5.10, 8.10. Christopher Robin (PG) 2.00, 5.00, 8.00. Mamma Mia! Here We Go Again (PG) 2.05, 5.05, 8.05 (not Wed). Incredibles 2 (PG) Sat & Sun 2.10. C’est La Vie! (Le Sans De La Fête (15) 2.05, 5.05, 8.50. Scott Cinemas – The Atrium Cinema (01342 321666): Mamma Mia! Here We Go Again (PG) Fri-Tue 3.05. The Children Act (12A) Fri-Tue 5.40, 8.20; Wed & Thu 3.00, 5.40. Teen Titans Go! To The Movies (U) Sat & Sun 12.45. The Spy Who Dumped Me (15) Fri-Wed 8.05. Christopher Robin (PG) 3.30, 5.55. The Nun (15) Fri-Tue 3.45, 6.15, 8.45; Wed 1.40, 4.10, 8.30; Thu 1.10, 3.40, 8.30. Kids’ Crew: Peter Rabbit (PG) Sat 10.10. Kids’ Crew: Sherlock Gnomes (U) Sat 10.10. Incredibles 2 (PG) Sat & Sun 12.55. Hotel Transylvania 3: A Monster Crew (U) Sat 1.15; Sun 10.10, 1.15. Royal Shakespeare Company: The Merry Wives Of Windsor (12A) Wed 7.00. Opera Australia: La Bohème On Sydney Harbour (12A) Thu 7.00. Pavilion (01323 841414): Swimming With Men (12A) Fri-Tue 7.45; Wed & Thu 2.15, 7.45. Incredibles 2 (PG) Sat & Sun 2.15. Hailsham FM: Grease Sing-A-Long (U) Sat 7.00. The Capitol (01403 750220): The Children Act (12A) Fri, Sun & Wed 1.45, 4.45; Sat, Tue & Thu 7.45. The Festival (15) Fri & Sun 7.45; Sat, Mon & Thu 1.45, 4.45; Tue 1.45, 7.45. Searching (12A) 2.15; 5.15 (not Thu); 8.15. Blue Oasis Screening: Searching (12A) Sat 11.00. Mamma Mia! Here We Go Again (PG) Mon, Wed & Thu 11.15. Horsham Film Society: The Square (15) Mon 8.00. Box Office Babies: Mamma Mia! Here We Go Again (PG) Tue 10.30. Royal Shakespeare Company: The Merry Wives Of Windsor (12A) Wed 7.00. Depot (01273 525354): BlacKkKlansman (15) 2.30, 5.30, 8.15 (not Tue). The Miseducation of Cameron Post (15) Fri, Sun, Mon & Thu 5.45, 8.30; Sat 5.45, 8.45; Tue 3.00, 5.00; Wed 1.00, 5.45, 8.45. Cold War (15) Fri 3.15, 8.45; Sat 3.00, 6.00; Sun & Mon 3.30, 8.45; Tue 6.15; Wed 3.15; Thu 3.30, 8.45. The Children Act (12A) Fri 2.45, 6.00; Sat 3.15, 8.30; Sun 6.00; Mon 2.45, 6.00; Tue 3.45; Wed & Thu 3.00, 6.00. The Gleaners And I (U) Tue 8.30. Le Bonheur (15) Wed 8.30. Glyndebourne Encore: Vanessa (12A) Tue 7.15. Pandora’s Box (PG) Sun 2.00. Windmill Cinema (01903 715920): Mamma Mia! Here We Go Again (PG) Wed 6.05; Thu 8.15. Swimming With Men (12A) Wed 8.30; Thu 6.05. The Picture House (01825 764909): Hurricane (15) Fri 2.00, 6.00; Sat 3.45, 8.20; Sun 1.45, 5.45; Mon & Tue 2.00, 5.45; Wed 2.00, 8.35; Thu 4.05, 6.20. The Children Act (12A) Fri 4.00, 8.35; Sat 6.00, 8.35; Sun-Tue 4.00, 8.35; Wed 4.00, 6.20; Thu 1.50, 4.00, 8.35; Parent & Baby Screening: Thu 11.30. Christopher Robin (PG) Fri & Mon-Thu 1.45, 6.10; Sat 1.30, 4.00, 6.10; Sun 1.30, 6.10; Parent & Baby Screening: Thu 11.00. Mamma Mia! Here We Go Again (PG) Fri, Mon & Tue 2.15, 6.15, 8.25; Sat & Sun 3.45, 6.15, 8.25; Wed 1.30, 4.00, 8.25; Thu 2.15, 4.45, 8.25; Parent & Baby Screening: Thu 11.15. Hotel Transylvania 3: A Monster Vacation (U) Sat 11.30, 1.45; Sun 11.40. Incredibles 2 (PG) Sat 11.15, 1.15; Sun 12.00. Spitfire Plus Recorded Q&A (PG) Mon & Tue 8.00. Saturday Morning Movie: The Little Mermaid Sing-A-Long (U) Fri 8.15; Sat 10.30. Elvis ‘68 Comeback Special (12A) Sun 2.30. Royal Shakespeare Company Live: The Merry Wives Of Windsor (12A) Wed 7.00. Opera Australia: La Bohème (12A) Thu 7.45. Dome (01903 823112): Ant-Man And The Wasp (12A) Sat & Sun 3.30. Christopher Robin (PG) Fri 5.20; Sat & Sun 10.00, 5.45; Mon 12.30, 5.20; Tue 11.45, 5.20; Wed 11.45, 12.00; Thu 11.45; Parent & Baby Screening: Mon 12.00. Final Score (15) Fri, Mon, Tue 7.45; Sat & Sun 8.10; Tue 7.45; Wed 7.30; Thu 8.15. Hotel Transylvania 3: A Monster Vacation (U) Sat & Sun 12.45. Hurricane (15) Fri & Mon-Wed 3.20, 8.15; Sat & Sun 11.00, 8.30; Thu 3.20, 5.45. Incredibles 2 (PG) Sat & Sun 10.15. Mamma Mia! Here We Go Again (PG) Fri 3.30; Sat & Sun 1.00, 6.00; Mon 3.30; Tue 12.25, 3.30; Wed 3.10; Thu 12.15. Connaught (01903 206206): Puzzle (15) Fri 3.45, 8.15; Sat 10.15, 3.45; Sun 1.00, 5.45; Mon 8.15; Tue 1.00, 5.45; Wed & Thu 1.00, 3.45. Cold War (15) Fri & Mon 6.00; Sat 12.40; Sun 8.15; Tue 8.15; Wed 4.15; Thu 5.15. The Nun (15) 6.15, 8.30. Saturday Morning Pictures: Thomas And Friends – Big World! Big Adventures! (U) Sat 10.15. Nic Cage Triple: Con Air (15) Sat 3.00. Nic Cage Triple: The Rock (15) Sat 5.20. Nic Cage Triple: Face/Off (18) Sat 8.00. Silver Screen: Puzzle (15) Mon 11.00. Royal Shakespeare Company: The Merry Wives Of Windsor (12A) Wed 7.00. Opera Australia: La Bohème On Sydney Harbour (12A) Thu 7.45.